United’s 3-1 win over their rivals stemmed from a rather typical performance from Van Gaal’s team as their possession game first held a great focus on stability which later developed into a more aggressive performance following half-time. The starting formations from the two teams. After what has been a disappointing start to the season from Rooney, the recent England record-breaker was out of the squad entirely as Fellaini took on his role as United’s striker from the start. Unsurprisingly, the home team showed in their 4-2-3-1 shape with David De Gea making his return as their first goalkeeper.Chris Smalling and Daley Blind featured again as the two centre-backs in what is becoming a strong partnership in the heart of the United defence whilst they were, as usual, flanked by Luke Shaw and Matteo Darmian. Schweinsteiger put in another impressive performance alongside Michael Carrick who together formed the foundation of a midfield which had Herrera, Mata and Memphis Depay in the ‘3’ behind Fellaini as striker. Although Rodgers’ team selection hinted that we may have seen the 4-1-2-1-2 formation which been used in past seasons, the Northern Irish manager opted for a 4-5-1 shape. There was little change to the back 5 as again Mignolet featured behind a 4-chain of Nathaniel Clyne, Martin Skrtel, Dejan Lovren and Joe Gomez. Lucas Leiva was the deepest in the midfield triangle with Milner and Can both as 8s, though the new English signing situationally created a double 6 in defence. On the two flanks, both Firmino and Ings were out of position and struggled to support Benteke who was isolated for long periods of the game. Without possession, Rodgers’ team were organised in an interesting shape which situationally varied between a 4-1-4-1 and a 4-4-1-1 dependent on the orientation of the 3 midfielders in the centre. The defensive strategy was reminiscent of their 0-0 draw against Arsenal earlier in the season as they attempted to be compact and stable in a low block with pressure generally only being enforced quite deep in their own half. Both Milner and Can had the freedom to move up and support Benteke as well as pressing the United 6s, albeit not always effectively. Deeper in their own half, Milner would quite often drop in line with Leiva, presumably to increase the stability in the centre of their block which was being tested by the likes of Herrera and Mata moving in. Aside from this, it may also have been to cope with United’s new threat in Fellaini by supporting the defence in winning the 2nd ball from the Belgian target man. There was a distinct lack of pressure in United’s half, especially through the first 45 which was played at a low intensity. Rodgers’ side would rarely look to challenge the likes of Blind in their construction game and would only increase the pressure if the ball was moved to the touchline. This allowed for easy playmaking with Carrick and Schweinsteiger whilst raising no attempt to disrupt United’s possession game which was very focused on maintaining stability and being very selective in their attempts to penetrate the block. When they did press however, it was often quite poor and possessed some key issues. First and foremost, they struggled to develop defensive access as well as maintain it once they had established a means of pressing the ball effectively. This was generally through a lack of ball-orientation as Liverpool were generally passive so that even when they wanted to press higher up the pitch, their lack of preparation meant that they couldn’t effectively challenge the security of United’s possession. The pressing was also weakened by the poor support from teammates across the system. When they attempted to challenge United higher up, the pressing itself was often quite individual with a lack of co-ordination across the ball-near defenders which meant for little effective pressure as United could quite easily pass through it. This was quite common in wide areas, where Liverpool would react to the trigger by the ball-near midfielder moving wide to press the ball. However the other near Liverpool players rarely made an attempt to close up the space surrounding the main presser, giving United the ability to pass around the pressure through their superior positioning. Upon regaining the ball, Liverpool also struggled greatly to develop any threatening counter-attacks. The movements from the regain often lacked co-ordination with most of the players simply running straight forward which reduced their ability to form connections to progress the ball as a collective. 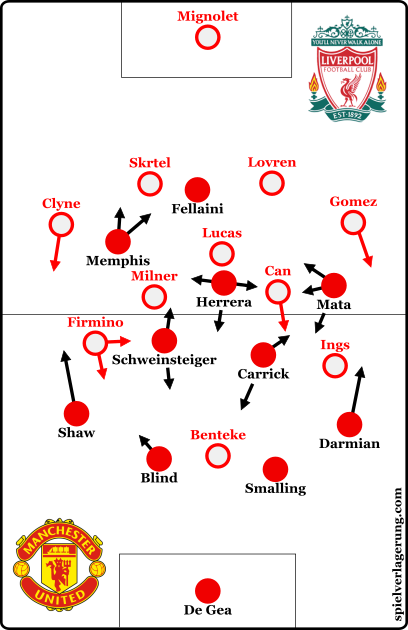 Through this, the breaks were often orientation around individual actions and many were stopped by United in 1v1 challenges with the ball still in Liverpool’s half. Alternatively, they would play a straight long ball to Benteke who was immediately isolated by the deep Ings and Firmino whilst the target man struggled against Smalling who contained Liverpool’s £30m signing well. In possession, Manchester United made a very typical performance with a low-intensity first half in which they looked to maintain stability in control over the possession and then progressed later on into a more expansive and aggressive game. At times it could be argued the issue of many english clubs as involving possession as a philosophy rather than utilising it as a tool was prevalent, yet the stability which Van Gaal created was an important foundation as they grew into the game later on. Deep circulation, orchestrated by the double 6 was also an effective tool throughout the 90 minutes as they opened up spaces quite well (though this was also through the asymmetry of Carrick and Schweinsteiger) albeit struggling to develop on that. With both Schweinsteiger and Carrick deep, United were comfortable and secure on the ball with a quite ball-oriented positional structure through the midfield. This did have its downsides, as they lacked penetration in the centre of the pitch and were often content to make non-threatening ball circulation in a ‘u’ shape around the Liverpool block despite the away side’s issues in access. Their intentions to maintain stability in possession was helped well by their opposition whose passivity and then their ineffectiveness when they did press made little challenge against LVG’s possession game. The two United pivots were amongst the top performers and worked well together as they were central to the performance of United with the ball. A key feature of the partnership was the slight degree of asymmetry from the two movements. As one would move vertically, usually to create a greater presence higher up the pitch as well as the basic benefits of vertical staggering, the other would shift side-to-side to offer themselves for the connections. Through this, the midfielders opened up spaces for each other which enhanced their ability to dictate the play with less pressure from the opposition. I really don’t understand Rodgers. A diamond seems like a better option for me. If the CAM pushes back in defense to form a block, then the two midfielders could push a little wider, something Can has done before and Milner is comfortable doing. If you go deep enough, then Lucas could also join the midfield line to form a tight 4-4-2 block which think United would find much harder to break open. And Ings left-wing was disastrous, why put him in a role he isn’t comfortable in? It would’ve been far more beneficial to have him supporting Benteke with the runs he makes allowing Benteke to flick it on rather than bringing it down.